True, there are plenty of services out there that let you watch live streaming television via the internet. But what if you’re on the move, in a bus, on a train, or even somewhere out and about, camping? Internet and all the distractions it brings is probably the last thing you want, but you might still want to watch television. The Elgato Eye TV W is there just for that kind of an occasion. 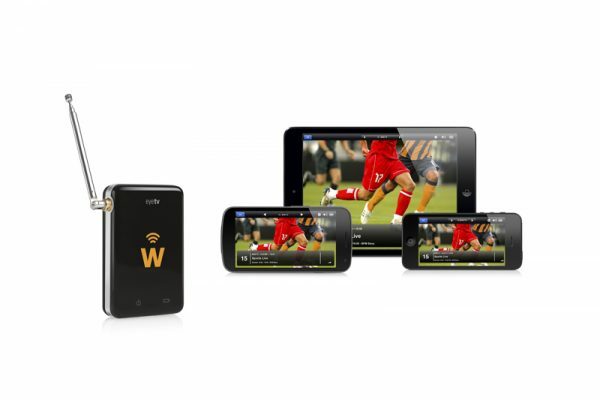 It connects to your device, whether Android or Apple wirelessly, ,and using the built in TV tuner, it allows you to watch television, regardless of where you are. It also features a built in battery, so you don’t even have to plug it to your device. The device works through their app, which is available on the App Store, Google Play, and even on the Amazon App Shop. It allows you to pause and timeshift live TV, record the current programme, or view what’s on later. It comes with flexible aerial options for optimum reception. Telescopic antenna for great reception on the go, and the rod antenna for when you’re at home or at work. · Mobile TV hotspot for live TV on iPad, iPhone & Android devices. Receives over-the-air Freeview and therefore doesn’t require an internet connection. Ships with flexible aerial options. · Connectivity: 802.11b/g Wi-Fi with a range of 10 meters; MCX antenna input. · Power: Built-in rechargeable lithium-ion battery (charging via built-in Micro USB port) lasts for up to 4 hours. · What’s included: EyeTV W comes with a miniature telescopic antenna (MCX), a rod antenna with magnetic base and detachable suction cup, a Micro USB charging cable and a printed quick start guide. · Supported Devices: The EyeTV W App requires an iPad (iPad 2 or later), iPad mini, iPhone (iPhone 4 or later) or iPod touch (4th generation or later); with iOS 6.1.3 or later. On Android, EyeTV W requires Android 4.0.3 on an Amazon Kindle Fire (2. Generation), or Kindle Fire HD; Google Galaxy Nexus, Nexus 4, Nexus 7, or Nexus 10; HTC One S, or One X; Samsung Galaxy Note, Note II, S II, S III, S III mini, S4, or Tab 2. · Dimensions & Weight: 64 x 16 x 42 mm, 44 grams. EyeTV W is is available from Elgato (www.elgato.com), Amazon, the Apple Store, and selected retailers for £69.95. The EyeTV W app is free and is available on the App Store, Google Play, and the Amazon App-Shop.